You read it here first, folks. 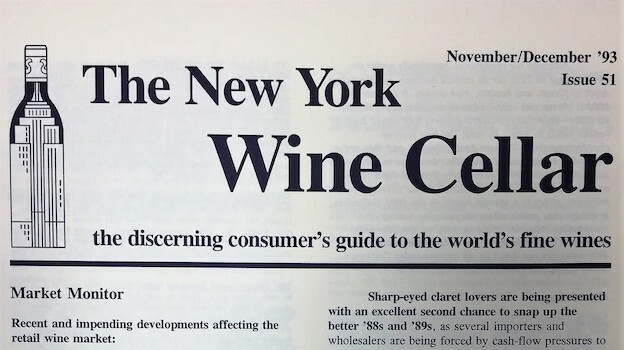 The New York Wine Cellar was the first publication in America to inform you that 1990 produced at least as many great, collectible clarets as the previous year, and to recommend that, rather than go hog-wild over the '89s, you save some of your available funds for the '90s. Now that the '90 clarets have had a year or more in bottle, it is clear that this vintage is a fitting exclamation point to the greatest decade, weather-wise, in the long history of Bordeaux. That does not mean that 1990 can be bought blind. Far from it. 1989, as we wrote a year ago, produced an opulent, extremely ripe and variable crop of wines. But only the best of these wines have the levels of extract and underlying structure to offer exciting medium- term development potential. The same can be said about 1990. These were two of the hottest and driest growing seasons of the century, in a class with 1947 and 1949. In both '89 and '90, the Bordelais faced complicating factors: most importantly, vine and grape maturation retarded by drought, and periods of September rainfall. Picking strategies were of paramount importance. Many proprietors learned from their experience in 1989, and did a better job harvesting the following year—in many instances picking optimally ripe fruit over a more protracted period. Although 1990 witnessed a second consecutive enormous crop load, more chateau owners carried out "green harvesting" at veraison to reduce ultimate yields. This crop-reduction had the additional benefit of partly correcting the uneven cabernet ripening that had resulted from unsettled weather during the period of flowering. We find the '90s, in general, to be somewhat fresher and less roasted than the '89s, and generally less aromatically evolved. Only a few of the top wines betray signs of raisiny overripeness. At the classified growth level, fewer wines show the finishing dryness that plagued numerous '89s containing grapes whose skins and tannins were not thoroughly mature. But crop-thinning, followed by strict selection of the better lots for inclusion in the grand vin, was essential to making great wine in 1990. While a host of '90s have the velvety, glycerol palate feel that comes with wines high in alcohol and low in acidity, too many of them, we fear, won't have much of a story to tell when the baby fat burns off three or six or ten years down the road. At the top levels, numerous exciting wines were made, With the exception of Mouton, all of Bordeaux "big eight" (the four Médoc first growths, Haut Brion, Pétrus, Ausone and Cheval Blanc) made stunning wines. Montrose and Léoville-Las Cases are two additional stars of the vintage. As a general rule, the further south you go on the left bank of the Gironde, the less extract and structure the wines display, but there are noteworthy exceptions. Pomerol and especially St. Émilion produced many magnificent bottles, but while St. Émilion clearly did better in 1990 than in '89, in Pomerol only L'Evangile seems clearly more successful in the later vintage. Except for a few limited-production right-bank wines like Pétrus, Lafleur, Le Pin, and Tertre Rôteboeuf, virtually all of the 1990s can still be found on the shelves by the enterprising collector, though prices for these scarce wines, as well as for sought-after items like Montrose and Latour, have climbed. With the Bordelais now holding three vintages ('91 through '93) that will be difficult to sell unless tariffs are cut sharply, pricing for '90s is likely to remain firm—even while '88s and '89s are discounted by American importers and retailers desperate to raise cash. Price ranges listed on the following pages for each 1990 claret represent what you can expect to pay today in major metropolitan wine markets. Due to the space constraints of the original publication, tasting notes on only the most important classified growths and other wines of particular interest are attached.